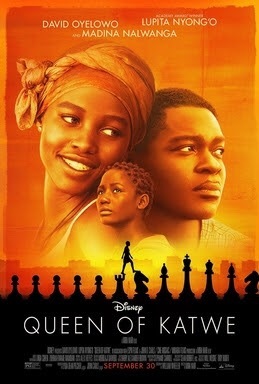 “Queen of Katwe” A film by Mira Nair.Is a film Based On a true story,That Sends out a very strong message to the audiences,That no matter what background you belong to,No matter where you come from.You must be given the opportunity to prove yourself.The film revolves around the central character Phiona (Played by Madina Nalwanga) the movie on who it’s actually based and Robert Katende (Played by David Oyelowo,who was last seen playing the role of Sir.Mater Luther King in Salma)Play’s the role of the coach who start’s training some of the kids in a ‘ Katwe’, a small village of Uganda,how to play Chess ,as a part time job,But makes it a full time job when he realises the potential of these kids becoming Master of the game.The amazing part of the story is how they adapt ,and prove their worth by defeating students from the best high school in the Uganda. The timely expression and dialogues with South African music add the extra touch to make the movie an enjoyable one. The complete star cast and the team involved in the film,Has done a really good job with the movie.